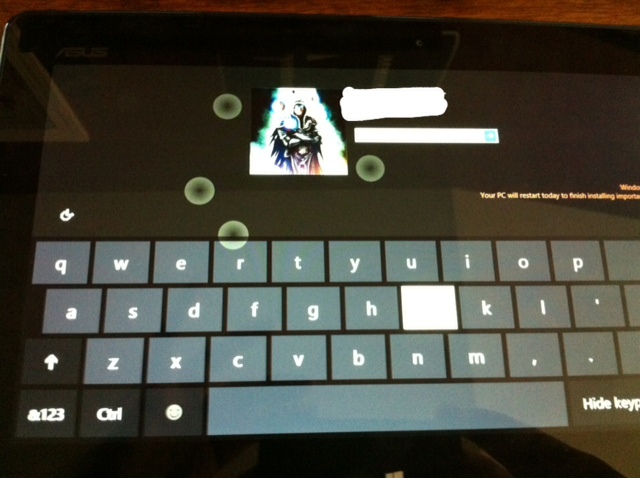 I have an Asus Vivo Tab RT, had it for a while, but for a few months I've had these phantom touches... Areas on the touch screen that acted as if someone was touching the screen, but obviously nothing was. I've cleaned the screen, in case it was just a buildup of static...nothing. I've reset the system several times, wiping it and still it keeps coming back. These phantom touches render the tablet almost unusable as when I try to swipe the screen or click on something, the cursor jumps or acts like there's two contact points and does a different function. Half of the time I can not even get past the swipe screen to log into the tablet. Any help would be greatly appreciated. Here I went ahead and took a photo of the screen. You can clearly see where there are multiple contact points on the screen, and they are always different each time I open it. if it's a corruption in the data....that is being restored by a factory reset...then it's their data that is corrupting the stuff.